October 28, 2014 (Tony Cartalucci - NEO) - Generally historical revision takes place long after events unfold and the victors attempt to bury humiliating or inconvenient truths. Today, in the age of information, these would-be victors are finding it increasingly necessary to revise history in real-time through a strategy of increasingly repetitive, but decreasingly effective propaganda. It was only in 2007 that US foreign policy openly sought to pursue war against Iran, Syria, and Lebanon's Hezbollah, while undercutting pro-Iranian factions in Iraq which at the time the US was still occupying. Failing to accomplish this directly, the US planned a not-so-covert proxy war that would include funding, politically backing, and even arming groups ranging from the Muslim Brotherhood to militants aligned with Al Qaeda itself. This is perhaps best summarized by the prophetic 2007 report "The Redirection: Is the Administration’s new policy benefiting our enemies in the war on terrorism?" written by Pulitzer Prize-winning journalist Seymour Hersh and published in the New Yorker. Hersh would also go on to chronicle American political and financial support that was being provided to the Muslim Brotherhood, even then under then US President George Bush. In all, the supposedly "spontaneous" uprisings referred to by the Western media as the "Arab Spring" in 2011 were being engineered years ahead of time - not in an attempt to promote peaceful pro-democratic aspirations, but to serve as cover for ultra-violent foreign-backed inssurections that would leave a trail of destruction stretching along Africa's northern coast, all the way to the borders of Iran, Russia, and even China. After denying any role in the "Arab Spring" unrest, the US would soon not only openly support the protesters in the streets, but also support armed militants that followed in the wake of protests. This support included that of a military dimension - with militants in Libya being provided aircover and special forces initially, to eventually the air-dropping of weapons, equipment, and other supplies. US Senator John McCain (R-Arizona) would even travel to the terrorist capital of Libya - Benghazi - and offer US support in person. He would stand literally upon the footsteps of Benghazi's courthouse where Al Qaeda rallies would be held shortly after, promising weapons to men who would later slaughter a US ambassador in that very city. After the destruction of Libya's government amid NATO's intervention, Benghazi would serve as a terrorist epicenter where weapons, cash, and fighters were being staged before being sent to NATO-member Turkey and then to fight in northern Syria. Among these terrorists were seasoned militants of the Libyan Islamic Fighting Group (LIFG), an official Al Qaeda franchise in North Africa. 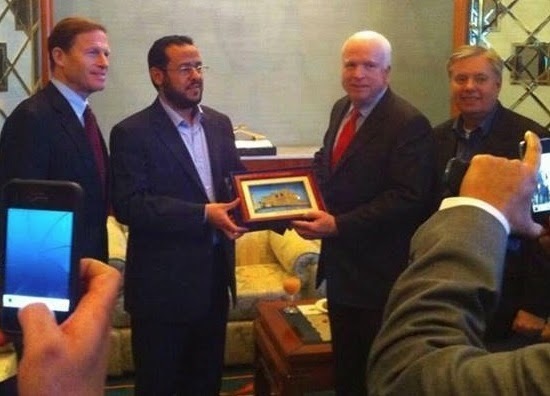 One of their leaders, Abdelhakim Belhadj would eventually find himself in power in Tripoli after the collapse of the Libyan government, and even have his photograph taken with Senator McCain. Clearly, the rise of the so-called "Islamic State" or ISIS, did not happen overnight, nor by accident. It was not only the logical result of the United States continuing its strategy of proxy warfare it had carried out against Libya, now unfolding in Syria, it was also the premeditated, documented result of what veteran journalist Seymour Hersh had warned about in 2007. The US has found itself revising history, attempting to explain the existence of ISIS lurking in the footprints of its massive support of so-called "moderates" in Syria's ongoing conflict. The US has attempted to claim ISIS has built itself on "donations," selling oil to the black market, and by taking hostages for ransom. If only building a multinational terrorist mercenary force was that easy, we could imagine Syria, Iraq, and Iran would likewise have vast mercenary armies to outmatch ISIS in an afternoon. The reality is, to explain how the US and its regional partners have provided "moderates" with billions in aid only to have ISIS rise up and displace these "moderates," we must realize that there were never any "moderates" to begin with, and that the US intentionally armed and funded terrorists, just as Hersh warned in 2007, to create a terrorist mercenary army that "espouses a militant vision of Islam" and is "sympathetic to Al Qaeda." ISIS didn't displace the "moderates," the truth of what America has done in the Middle East has displaced the lies the West has been telling the public starting in 2011 at the height of the so-called "Arab Spring."